The A.V. Club: If there’s anybody on this show that is safe outside of the man whose name is in the title, it’s the dogs, right? Bryan Fuller: Oh yeah, absolutely. And this was an episode where it’s like, “Oh my God, we put a dog in danger,” which, the impetus for that really is, it’s terrifying for Will Graham that one of his animals would be in danger in some way. Also, I just love that Will Graham wasn’t going to stay and fight. He was going to get his dog back to a safe place. [Laughs.] So yes, there was that moment where it’s like, “Oh my God…” but no. We would never actually kill the dogs. AVC: This episode is so intimate. You use so many close-ups on Will and on Hannibal, just to grab their micro-expressions or Mads Mikkelsen’s tiny little nod at the very end. What role do you see intimacy playing within this story? BF: This episode we started out with the idea of, “Let’s tell a werewolf story,” as Will Graham is feeling like he is becoming more of Hannibal’s beast, and we wanted to have an analogy to Will in another patient of Hannibal Lecter’s. That patient’s journey was much clearer to that character than Will’s journey has been for him. The intimacy that comes with really opening up and allowing some element of your innermost, darkest self to emerge invites that level of intimacy. I feel like it actually started in episode eight, at the very end, when Hannibal gives Will the Thomas Harris speech about, “I can never predict you.” They’re very close, yet it’s not sexualized. It becomes brotherly in those moments. It has this fantastic, intellectually intimate, soulful connection, and with that comfort, a physical intimacy that is not necessarily sexual, but it is very much how you see close brothers interacting. This brotherhood of Will and Hannibal, I feel, the physical intimacy aspect of it, really started at the end of episode eight and then carried through into this episode nicely, because it really is the arc. In the final six episodes of this season, we get Will and Hannibal closer and closer, because that’s what happens when you start to see so much of yourself in another person that you’re not afraid of getting too close, because you already feel connected to them. That’s what we really wanted to start laying the track for in this episode. Also the differences between how Hannibal interacts with Randall Tier, the kind of encouragement that he gives Randall Tier, and how that is juxtaposed from the actual intimate bonding that he’s had for Will Graham. Two different types of bonding, one that is more fostering and equal, and one that is more looking down on someone who still has so much to learn. BF: [Episode] nine really starts an arc that will reach a crescendo in 12, which is one of our best episodes of the season. I just think it’s fantastic and bonkers and hilarious and deeply disturbing. So the end of nine is sort of the beginning of 10, and it’s answered very quickly at the top of the next episode, but it absolutely is an acknowledgement, “Yeah, I sent him to do this. Yeah, you did exactly what I thought you were going to do. And now we can have a conversation,” which we will have at the beginning of the next episode. AVC: You’ve mentioned before that the theme of a Thomas Harris killer is transformation, and we get a really big look at that here, with Randall. What about transformation sets it aside as a theme of Harris’ work, and how do you try to incorporate that into the show? BF: We see transformation in Red Dragon with Francis Dolarhyde evolving to the red dragon, the superbeing. And we see transformation with Jame Gumb in Silence Of The Lambs, because he is a man who wants to transform himself into a woman. And in Hannibal the transformation of Mason Verger in terms of how he is constantly talking about how he’s with “the Riz” [the risen Jesus], and everything is okay now, and he’s moved beyond reproach in many ways because of how evolved he is with his accepting of Christ into his heart. I think that, by way of that pattern, transformation is very much a part of the Thomas Harris milieu. But I think it’s also a part of every story in general. You want characters to transform, because then they get to become something that they weren’t yesterday, and isn’t that a beautiful thing in some ways? 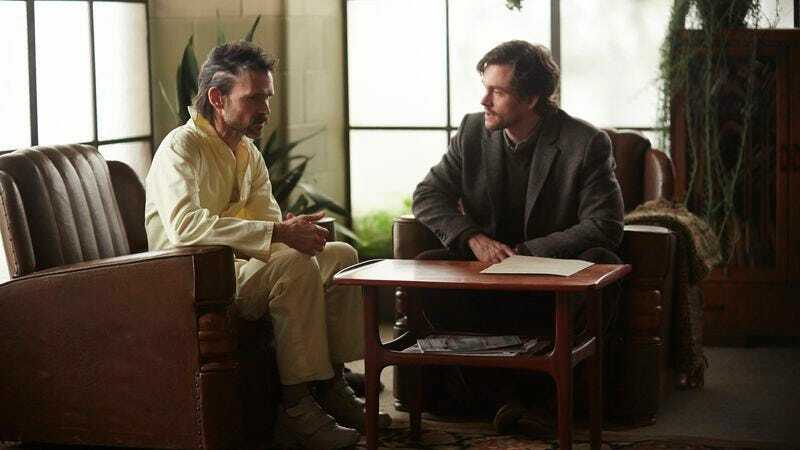 I think with this episode really hitting the transformation of Randall Tier from man into beast is talking about Will Graham transforming from socially awkward criminal profiler to sophisticated criminal mastermind. In some way is taking his natural born skill set and reimagining it for a new purpose, for a new self. So that is definitely what Hannibal Lecter is trying to cultivate with Will Graham, transforming him into a truer version of himself that he can actually share his life with. I think that, also, goes back to your comment about this episode feeling more intimate because Will is getting closer and closer to this rebirth, and we’re worried that it is a little too genuine, and perhaps Will may be fooling Jack and not Hannibal. BF: We’ve sort of given a history in subtle ways, hinting at it through some scenes in the first season, particularly with the Bedelia story and how that was reflective of a patient relationship where there was violence. And Bedelia, even at the end of the season says, “They’re going to start seeing your patterns of relationships with violent patients and ask questions, so you might want to knock that out.” So we knew that he had the capacity, and there is something in terms of Hannibal’s role as Devil in the world, where if you have it in you, it’s the Devil’s job to bring it out. You can’t really blame the Devil, because he actually gives you the choices. We say this later in the season, what Hannibal does is not coercion. It’s persuasion. He is a naughty, naughty man [Laughs.] who likes to encourage naughty behavior in other people because I think on some level he sees more of himself in it. It may help him better understand himself, so I think he’s curious about that capacity in others. Also, I think he is an agent of ill will in the world, because he’s curious what creates that behavior, and he’s curious about the consequences of that behavior. If he is the Devil in that capacity, then he’s certainly fascinated by man’s capacity for sin. AVC: This episode is similar to the old Jaws rule: “The less you see of something, the scarier it can be,” because we don’t ever get a good look at what Randall looks like in his rig. Why was that kept mostly offscreen? BF: Well, it was many factors. The man-in-the-suit factor is a big one. Because it’s television, we had very little time to build the suit. The suit that we have looks cool, but when you see it in motion, it’s such a guy in a suit. So it’s like, “Okay… that’s a guy in a suit.” And we were acknowledging that it’s a guy in a suit, but it was hard to get him to move in a way that felt cool. There’s a lot of tricks that we pulled—in one scene he’s galloping in the distance. That’s just a guy in a suit falling down. We used the right sections of it to build the sequence. So there’s a lot of monster-movie tricks that we deployed just to see less of the suit. Because when the suit was not moving, it looked very, very cool, and then moving, less so. AVC: Both this episode, and the series as a whole, share the idea of abuse of power and what it means to be helpless. What is integral to the show about building those relationships between the powerful and powerless? Come back next Saturday for thoughts on episode 10.